Money Pit Update | "MUFFIECAKES"
It has been a productive and fun week so far at the Money Pit. 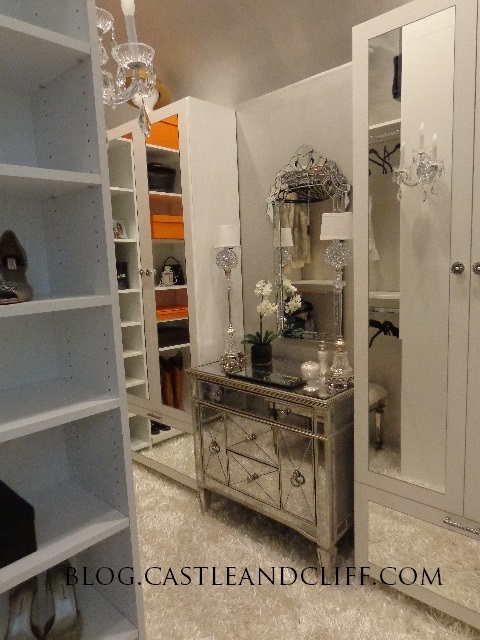 The president of Rylex Custom Closets contacted me about doing a photo shoot of my newly installed closet. I was happy to oblige as they were a pleasure to work with. It all started with a computerized 3D plan complete with elevations of how each wall would look. 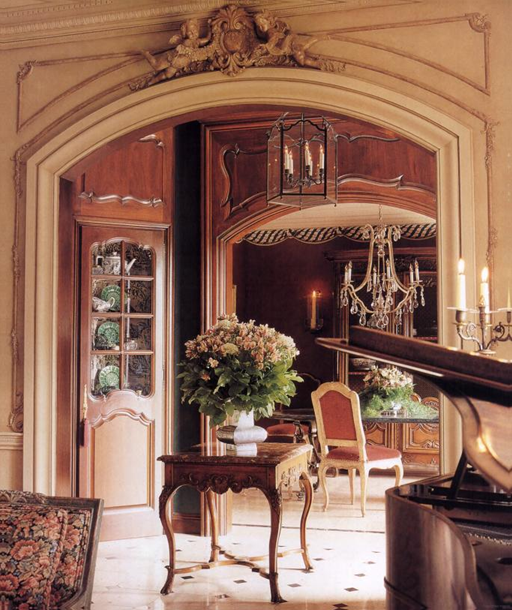 They custom built everything including mirrored covered doors and drawers and then installed within several weeks. I am so excited about the finished product. For carpeting, I bought two area rugs from Home Goods and cut them to fit and just direct glued them to the floor. 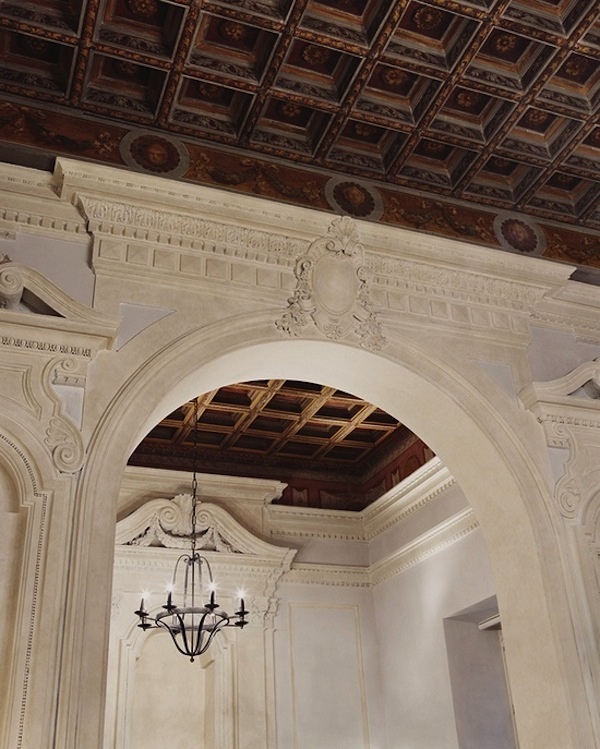 My ceiling is 12 feet high and they utilized every inch possible. The highest parts have handles that pull down the rod to a reachable height. 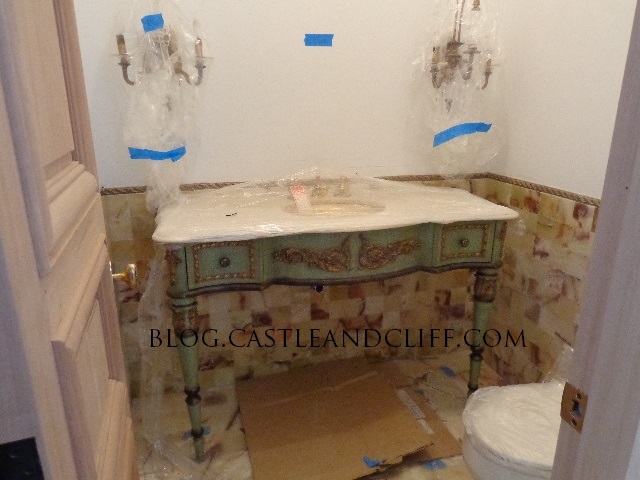 The powder room is tiled in onyx courtesy of my very energetic husband and his new wet saw. I bought the vanity at United Housewrecking as a complete unit. The sink is gold with hand painted flowers and the faucets are Sherle Wagner. 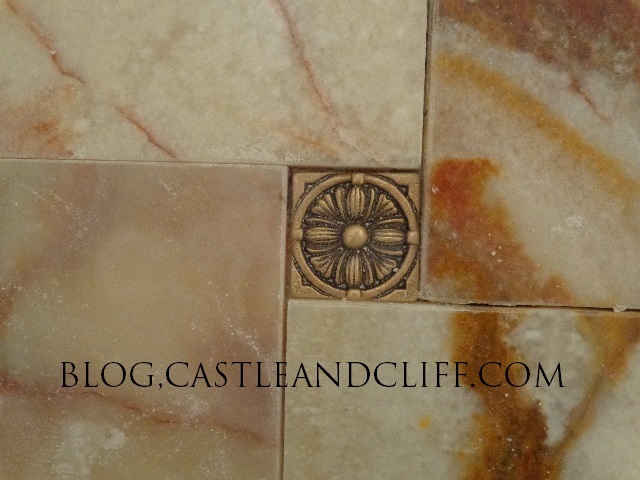 The tiles have 2″ gold decorative inserts. 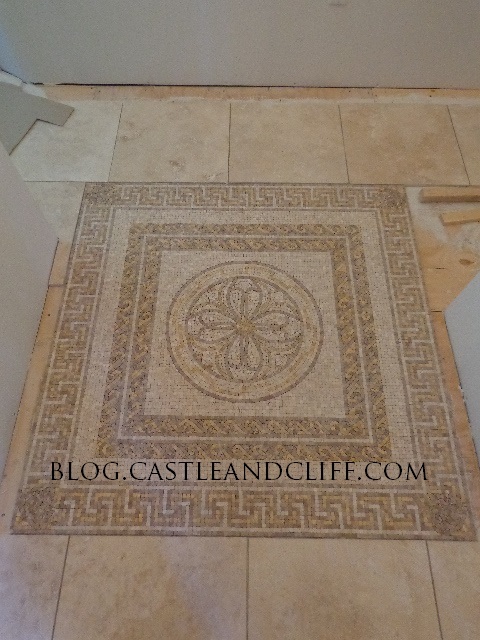 This mosaic is 4′ square and my hubby set it into the travertine in the master bath. 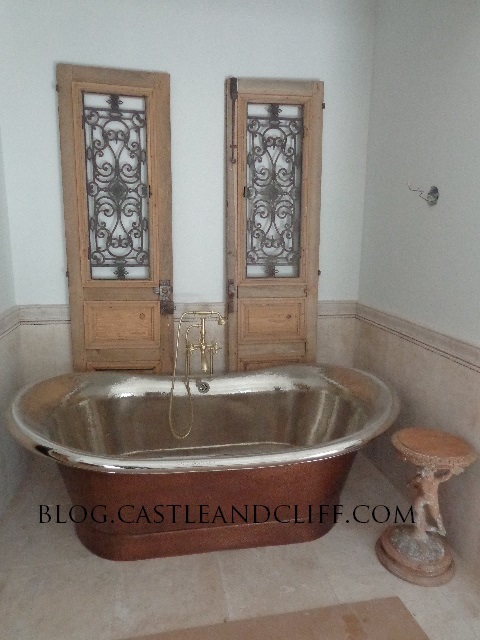 I bought the largest soaking tub available (I think!) It is about 42″w x 88″ long and I cannot wait to use it! Behind it I decided to stand the pair of doors I bought at the Charlotte Moss auction at Doyle Galleries in NYC. I might attach candle holders to them for some ambience! 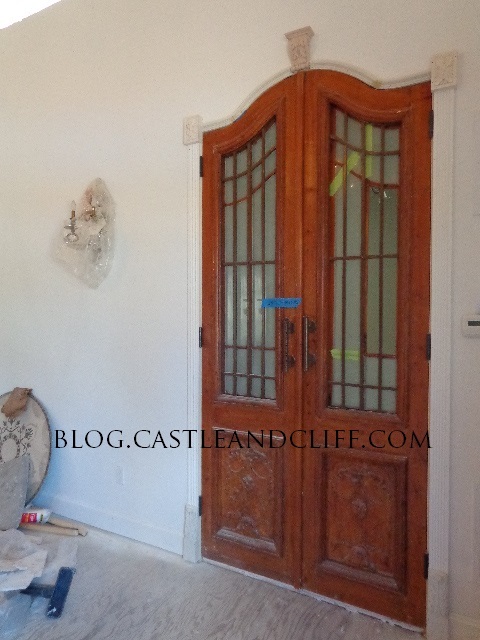 Antique French doors from United Housewrecking were installed.. 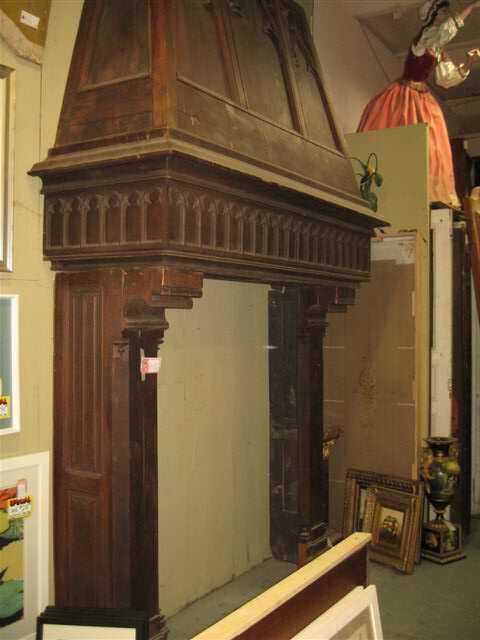 I purchased and stripped two vintage architectural pieces. They are 24″ high and 8′ long. You may recognize the center as I use it as the official logo for my blog and all my other social media posts. 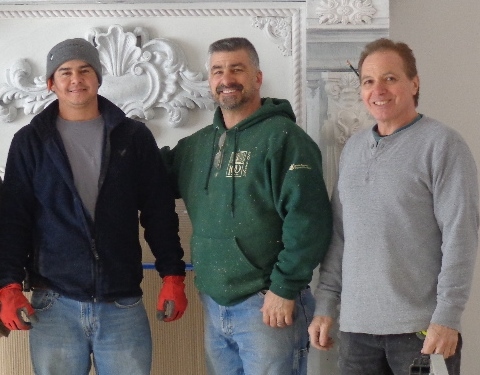 They are the starting point and moldings will be added as per a drawing and construction by my “Dream Team”, Vidal, Mike B and Mike T, all employees of Montana Contracting. …and it is now the one creation I am most proud of! 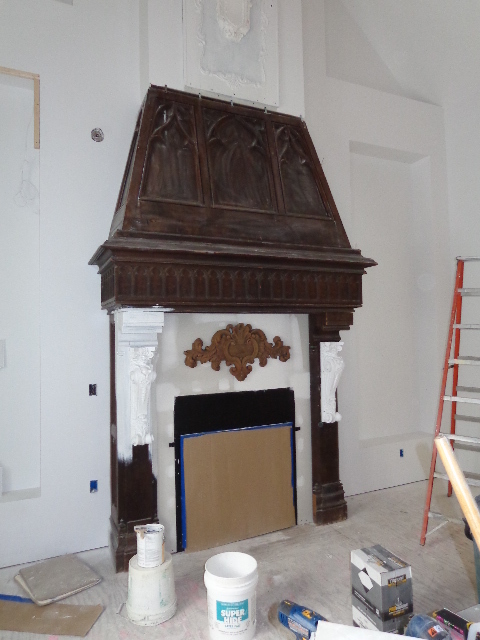 Ericka painted the mantel to match the travertine marble and the bookcases are faux wood on the outside with gold insides that will eventually have LED lighting inside. 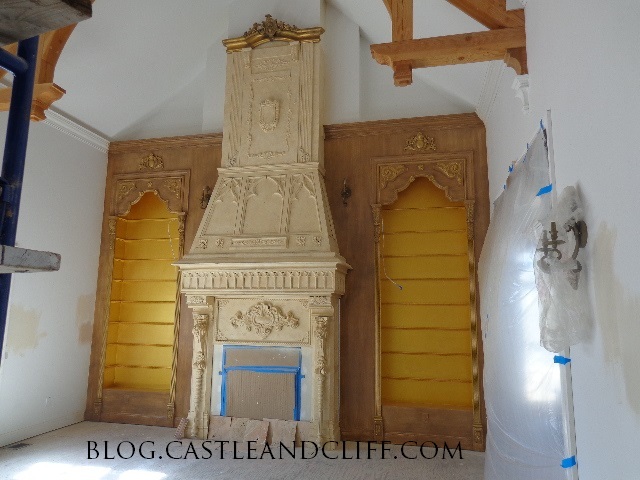 The gold will be burnished to match the gilded valance at the top which was purchased at auction. 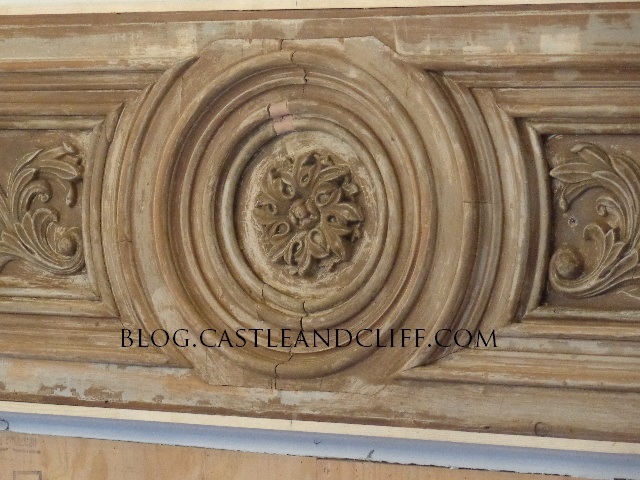 Now Hubby just has to attach the marble to the face of the fireplace. Plenty more still has to be done and I hope you are enjoying the progress as much as I am! Thanks, Kia. I’m waiting for pictures from you from Flyinge!!! Thanks, Bonnie. You have been there from the beginning. I can’t wait for a C/O! 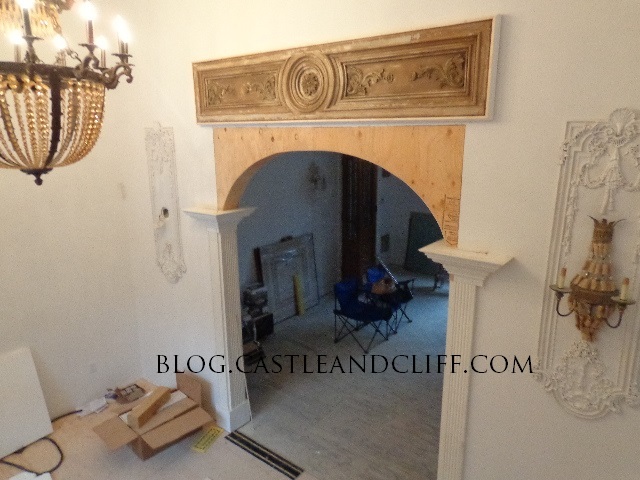 My mind is blown over the detail you have put into your ‘castle.’ I thought the cabin upstate was magnificent – I can’t imagine the finished product – I hope I get an invite to see it in person someday.